Did you know that the K2 workspace allows you to subscribe to events that happen inside the K2 land? Notification event allows you to send an email with context information to relevant recipients. You can hook this up to smart objects and workflow events. There are whole heap of events made available here including a K2license reminder event 🙂 nice. The good thing about this is that all this configuration is external to the process design itself. If you need notifications, You do not have to change the process to add a mail event. You smart object create, save, load, delete events are bindable. Also, workflow process, activity and event level events – activity started, escalations, etc are bindable. Further more you could write your own code that can be fired as the result of these events. Basically, you write a Class with static methods and deploy this DLL on to the k2server (hostserver\bin directory). Register this with the hostserver config file (SourceCode.EventBus.Assemblies.Config) and now you have these static methods available for binding as event syncs. 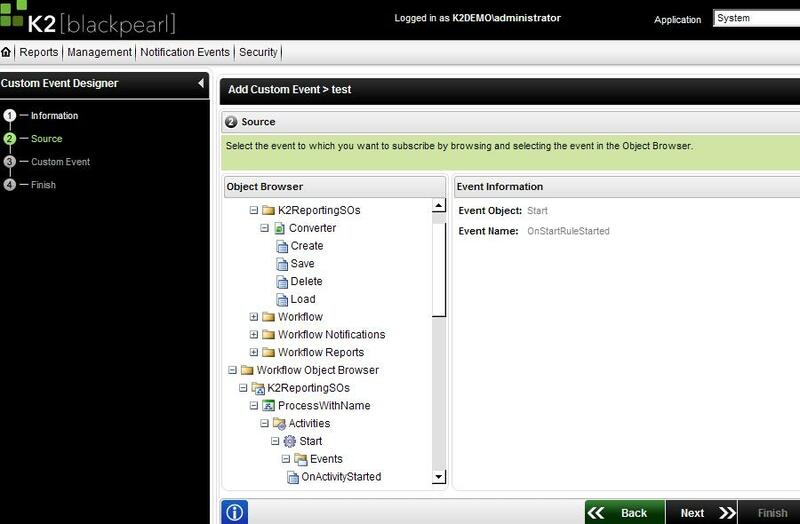 A user can go to workspace and create a custom event configuration and bind your method to a smart object or workflow event. thats it! Fixing Running Workflow Instance Errors with K2[blackpearl]…. How is K2 helping Sharepointers and others with workflow issues….. I wanted to know if I wanted to cleanp the K2 workspace by deleting some unwanted processes and events (and moreover some notification events) or disable them, then, how do we do that? PowerToolz has a search/filter and select all and delete button. You can also check out K2 Workspace, Workflow Server, Process, Instances node and find similar options. You can delete process versions and also notification event configurations from K2 workspace. But every time you deploy and if you have notifications turned on then the event wiring will be re-created.